In the city founded by the Roman emperor Augustus more than two thousand years ago it is possible to follow an accessible itinerary in safety and comfort. 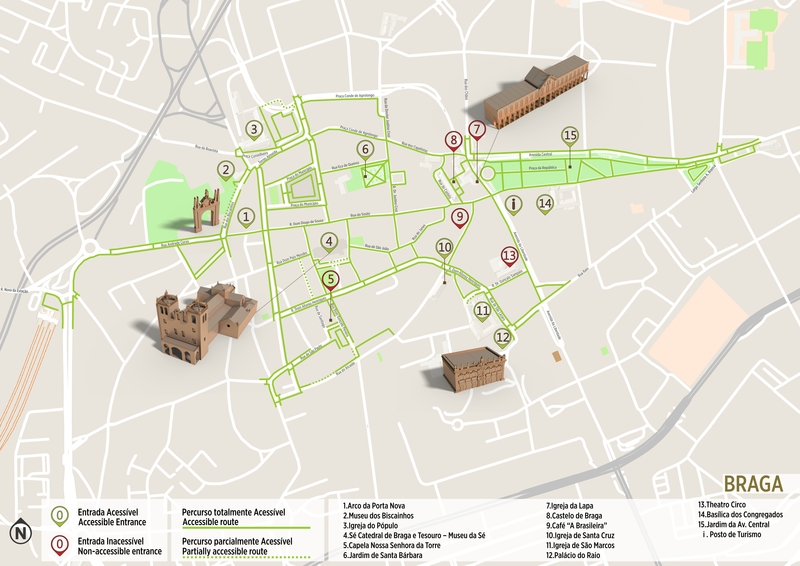 In the historic centre, the fact that most of the streets are smooth, the pavement being even and in a good state of repair, means that it's easy to get around and this is boosted by the existence of a lot of pedestrian streets and green spaces where you can rest along the way. Pedestrian crossing kerbs are sufficiently low and most of them are level, thus ensuring a continuous journey. Only a few have tactile signalling and light or sound signalling, but they are nonetheless properly marked and there is little risk associated with these situations. To start the Itinerary, we suggest symbolically the Arch of the New Gate (1 Arco da Porta Nova), which also marks the memory of one of the entrances in the old mediaeval wall. Heading along the first street on the left (Rua Dom Frei Caetano Brandão), you will find the route's first points of interest. In the 16th century Pópulo Church (3), which has an accessible entrance and a spacious interior, note the 18th century decoration, especially the blue and white tile panels. Leaving the church, go along the Rua dos Biscainhos where you'll find an old 17th century palace that is now the Biscainhos Museum (2). 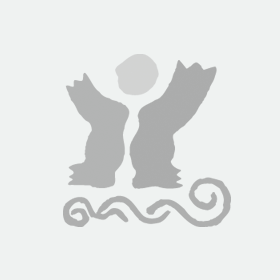 It houses an important collection of decorative arts from the 17th to the 19th centuries. 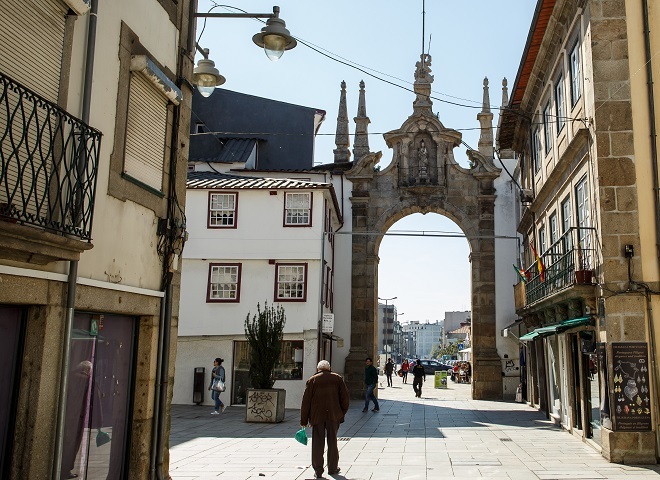 Returning to the Rua do Arco da Porta Nova, you can go into the Image Museum (Museu da Imagem) if you have time, and then carry on along the pedestrian street which is the main axis of the route. On the second block, we suggest you turn right, down the Rua do Cabido, to get to Braga Cathedral (Sé de Braga) (4). It is the oldest cathedral in Portugal and one of the landmarks of the city. It was built in the 12th century by D. Henrique and D. Teresa, the parents of Portugal's first king, D. Afonso Henriques. The surrounding area and the cathedral entrance are accessible and are definitely worth a visit. Once you've overcome a small flight of steps, it is also possible to access the Cathedral Treasure Museum (Museu do Tesouro da Sé). Leaving the cathedral, go left until you reach the baroque Chapel of Senhora da Torre, built in the 18th century to show Braga's gratitude for having been spared the earthquake of 1755. The building next door houses the Pius XII Museum (Museu Pio XII). Access to the Chapel is difficult because of a flight of steps at the entrance and occasional obstacles inside. On the left of the Chapel, pass by the arch until the Largo de Santiago, then go left again along the Rua do Anjo. At the end of the street, in the Largo Carlos Amarante, you will find the Church of Santa Cruz (10), dating from the 17th century, and the baroque São Marcos Church (11), from the 18th century. Behind the church is the emblematic Raio Palace (12), a striking example of 18th-century civil architecture which houses the Interpretive Centre of the Memories of Braga's Misericórdia (Centro Interpretativo das Memórias da Misericórdia de Braga). Continuing along the street Rua do Raio, on the left of the pedestrian Avenida da Liberdade you will come to the charming Avenida Central Garden (15). With its various restaurants, esplanades and shops it is perfect for a few minutes rest, perhaps in the historic A Brasileira café (9). In the centre of the Avenida do Jardim you can visit the Congregados Basilica (Basílica dos Congregados) (14), in the Rocaille style. The work of the 18th century architect André Soares, it is a key monument in Braga's built heritage. At the top of the Garden, from the Largo do Barão de São Martinho, you will easily get to the Rua do Souto and a couple of minutes later you will find the Lapa Church (7) and Braga's mediaeval castle (8), of which only the Keep, one of the five towers that defended the city, still stands. You thus get back to the main axis of the itinerary, which takes you back to the New Gate (Porta Nova), still with the possibility of going through the Garden of Santa Bárbara (Jardins de Santa Bárbara), close to the Municipal Square (Praça do Município). A regular resting place when strolling round the city. 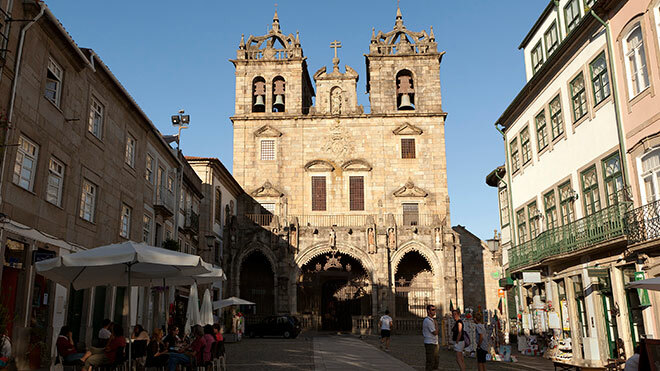 During your visit to the city you'll pass many other monuments that reflect Braga's importance as one of the country's leading religious centres, included in the Marian Shrine Routes and the Caminho de Santiago (Way of Saint James). The Holy Week celebrations are a highlight in the liturgical calendar and regularly attract a great many visitors to the city. It should also be mentioned that you can round off the itinerary with a visit to the D. Diogo de Sousa Museum of Archaeology (Museu de Arqueologia D. Diogo de Sousa), whose facilities are accessible. Although it is not in the historic centre it is important for learning about the city's history, especially its Roman origins. The museum was named as a tribute to the 15th-century archbishop (1461-1532), who was responsible for rebuilding the city and collecting and studying much of the archaeological remains. The TUB company has buses adapted for people with reduced mobility. They have access ramps, lifting platforms, reserved places, warning sounds and lights, and braille on the stop buttons. The stops have information on timetables and fares, as well as screens with information on waiting times. It is also possible to contact TUB in advance to request an adapted vehicle. Braga station has been fully adapted and has an accessible entrance, spacious interior, adapted WC, access to inside the carriages, and information by audio announcement and light display, besides other amenities. However, the ticket office counter for people with special needs is more than 80 cm high. In Braga, some taxi firms have fully adapted vehicles, enabling you to get round the city with greater flexibility and in more comfort.